It’s still early days for mobile messaging services to find revenue models and Line, the Japan-based company that has more than 150 million users worldwide, is exploring new ways to make money with the introduction of an app promotion initiative. The new program is called ‘Line Free Coins’ because Line users are compensated with Line Coins (the service’s virtual currency) in exchange for downloading selected apps. That’s significant because, to date, Line Coins can only be acquired through hard cash: either via a credit card or in-app payment — essentially this new program gives users free money to spend on Line. Initially the program will feature three of its own games — Line Bubble, Line Dragon Flight and Line I Love Coffee — but it will eventually expand to stock third-party apps in due course. And this is where the money and opportunity awaits the Japanese firm. For operators and businesses that utilize the smartphone as a promotional tool, the Free Coins service offers a chance for their apps to be promoted within the LINE platform. With LINE’s enormous user base and the service’s CPI (Cost Per Install) result-reward system, apps of operators and businesses have the potential to be downloaded and used by a global audience. In essence the program is an app store, which also provides incentives for users. While the system is unconventional because it provides financial benefits to all parties, the idea of showcasing apps inside a messaging app make a great deal of sense since users are highly engaged and will return to apps on a daily/weekly basis, meaning the platforms are ripe for gaining attention — not to mention that app store discovery is a common problem for many developers. The Line Free Coins program has launched today for Android users in Line’s home country of Japan, as well as Thailand and Taiwan — two of its strongest markets. 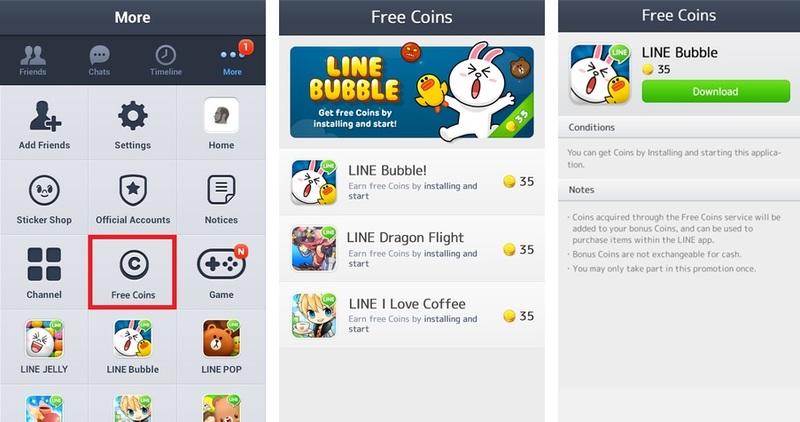 Line makes money by selling virtual content (such as rich-emoticon-like ‘stickers’), items within titles on its games platform (which has clocked more than 100 million downloads) and via its official accounts system which enables companies to engage with users on Line. The company posted revenue of $58 million in Q1 2013, which was up 92 percent on the previous quarter, and it continues to experiment with new models to further monetize its popular service. Already established in Japan and boasting a growing presence in Southeast Asia, it is looking to other regions to continue to grow its user base. Line is targeting Europe, the US, China and Latin America, where it is already seeing traction. Earlier this month, it added support for German, Italian and Portuguese to its iOS app, hinting at a broader push in Europe. Line competes with a wide range of messaging services, including China’s WeChat, Kakao Talk from Korea, WhatsApp, Tango and Viber, among others.